Would you like something you can email your colleagues — or print and take to your friends — that explains who we are and what we do? The three pieces below comprise short, explanatory overviews of Blankinship & Foster. 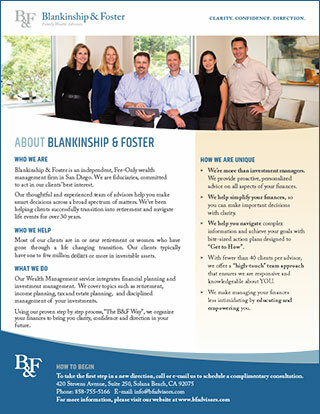 We’re an independent, Fee-Only wealth management firm in San Diego. 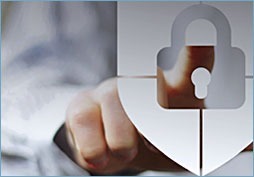 We are fiduciaries, committed to act in our clients’ best interest. Our thoughtful and experienced team of advisors help you make smart decisions across a broad spectrum of matters. You’ve worked hard for your money. You’ve saved and invested. 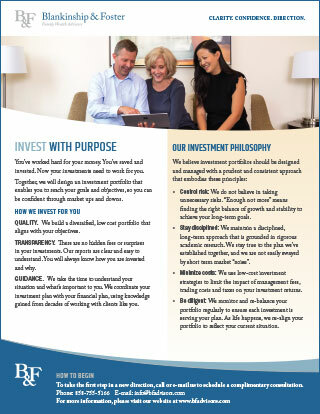 Now your investments need to work for you. Together, we will design an investment portfolio that enables you to reach your goals and objectives, so you can be confident through market ups and downs. 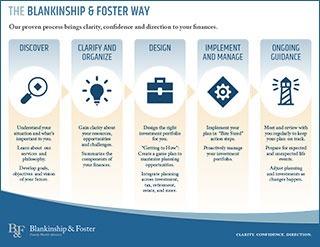 From beginning to end, we outline our process for guiding you to achieving your financial goals.